Chaplain SK James E. Nicewander 32° K.S.A. Historically, the medieval order of the Knights of St. Andrew was formed by King Robert the Bruce of Scotland, in 1314. Its purpose was to honor Knights instrumental in the victory over the English during the Battle of Bannockburn. In line with these historical beginnings, the modern Order of the KSA also focuses on outstanding service. In early 1993 the late, Ill. Weldon Good 33° of the Tulsa Valley in Oklahoma had a need for assistance during reunions. When he noticed that many brothers were joining the Scottish Rite but not returning to assist and participate, he developed the organization now known as the Knights of St. Andrew (KSA) as a service organization for the valley. In setting up the by-laws, he stated that the KSA would be a "Black Hat" group and any member who received the honor of KCCH (Knights Commander of the Court of Honor or Red Hat) could not hold an office or vote but they could still work and assist. The main duties of the Knights of St. Andrew were to assist as needed during the reunions and be available to the Valley's General Secretary for any assigned duties. 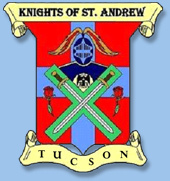 For further information about the Tucson Knights of St. Andrew, contact Sir Knight Randy Jager, KSA, at 520-405-6098. You can also download a copy of the Knights of St. Andrew Petition, complete it and return it.